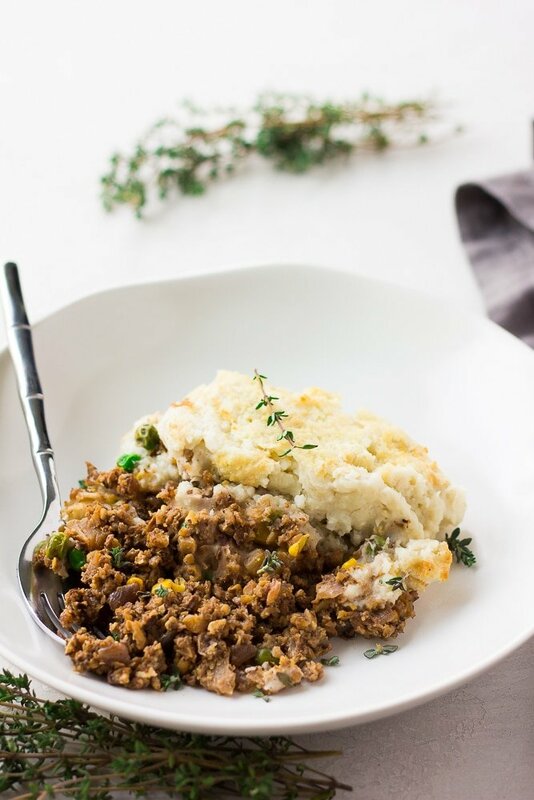 Comfort food classic: Vegan Shepherd’s Pie. Made with flavorful cauliflower mushroom walnut “meat” and the creamiest mashed potatoes. No one will miss the meat in this hearty, savory dish! Food can be so comforting. There is something about fluffy, warm mashed potatoes that stirs up these feelings for most of us. I also think of baked pasta dishes (like my Baked Ziti) or Pot Pie. 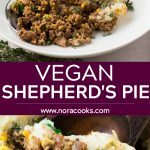 I am all about comfort food here at Nora Cooks, and I just love creating vegan versions of the food we love. The recipes I create tend to be a lot more life-giving and better for our overall health, as well. They won’t leave you feeling weighed down, like the meat/dairy laden versions, but they will satisfy you and fill you up! 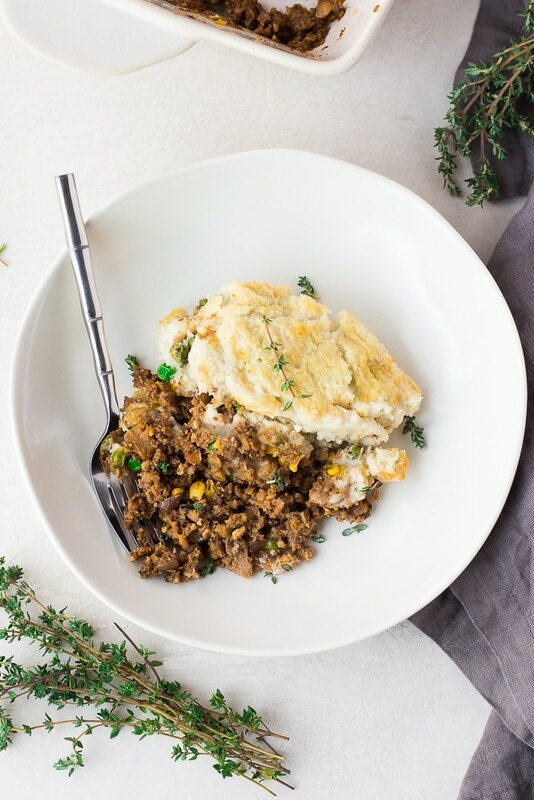 Vegan Shepherd’s Pie is no exception; this meal is comfort food at it’s finest. I tried a few versions before finding the one I liked the best, and that’s what I want to share with you today. First, you have a layer of the most delicious vegan “meat” ever, cauliflower mushroom walnut “meat”. Then some peas and corn, and finally the creamiest vegan mashed potatoes layered on top and baked to perfection. 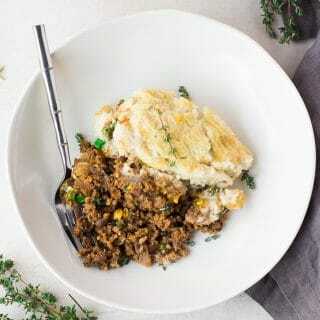 How do you make Vegan Shepherd’s Pie? First, make a batch of Vegan Mashed Potatoes and thaw 1 cup each of peas and corn. Next, make the Cauliflower Mushroom Walnut “Meat”. 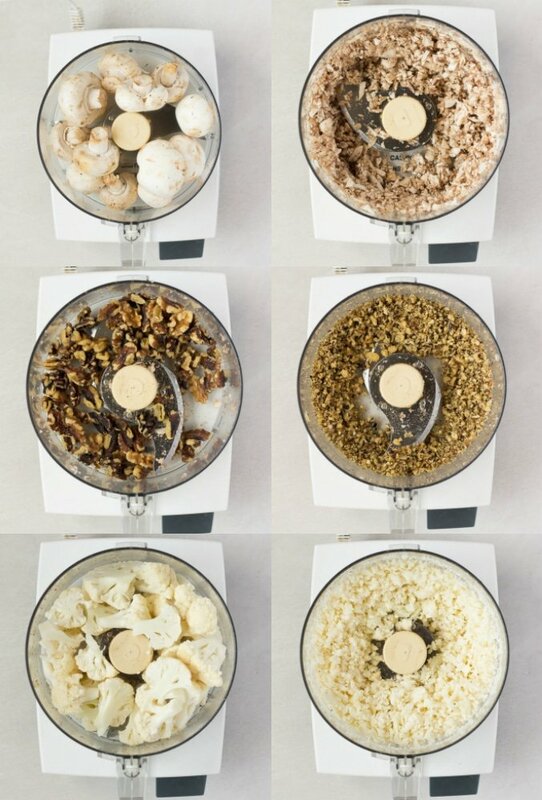 In a food processor, process the cauliflower, mushrooms and walnuts, one at a time, and add them to a large bowl. Don’t over process, you want small pieces, not mush or paste. Use the pulse feature. In a large pan, warm the olive oil over medium heat and add the diced onion and saute for 2-3 minutes. (SEE RECIPE CARD BELOW FOR FULL AMOUNTS.) 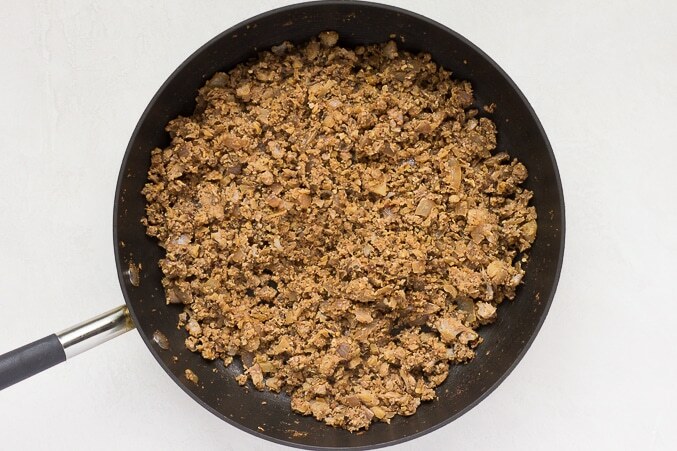 Add cauliflower, walnuts, mushrooms, and all the other “meat” ingredients and stir well to combine. Cook over medium heat, stirring every few minutes, for about 15-20 minutes. Add salt to taste, and set aside. Preheat the oven to 400 degrees F. To assemble the Vegan Shepherd’s Pie, transfer the “meat” to the bottom of a casserole dish and spread evenly. 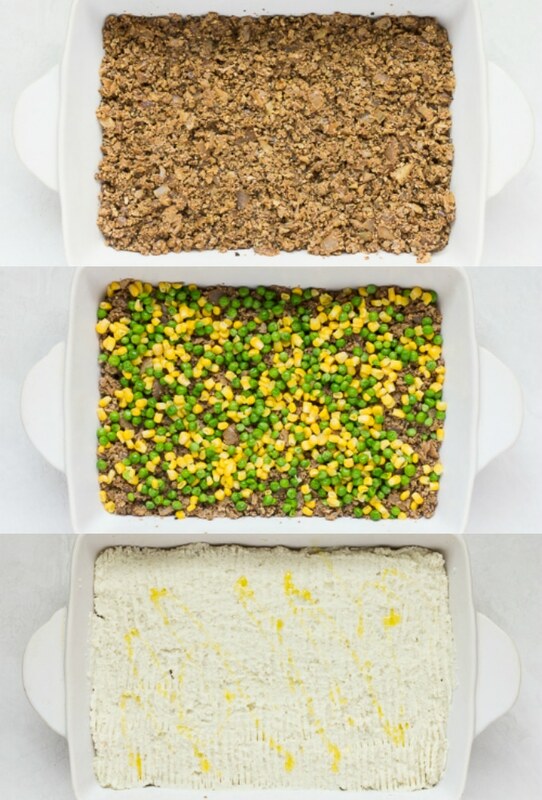 Sprinkle the peas and corn on top, then carefully spread the mashed potatoes. Use a fork, if desired, to create texture on the potatoes, and drizzle with a tiny bit of olive oil. Bake for 25 minutes, then broil for about 2 minutes to make the potatoes even crispier and more golden. That’s it! Serve hot. Leftovers will save for 3-4 days in the refrigerator. 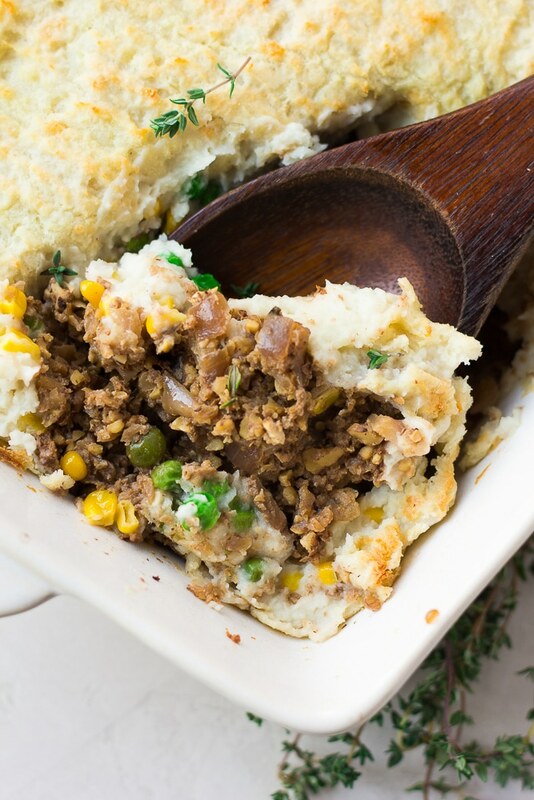 This Vegan Shepherd’s Pie would be perfect for a potluck or large get together. It also makes a comforting Sunday family dinner, where loved ones gather. It’s easy enough to make on a weeknight, if you have an hour to spare; or consider cooking it on the weekend as a meal prep for the week ahead! It’s also a delicious holiday dish, for Easter, St. Patrick’s Day, Thanksgiving or Christmas. Or any other holiday you celebrate! Looking for more hearty vegan main dishes? 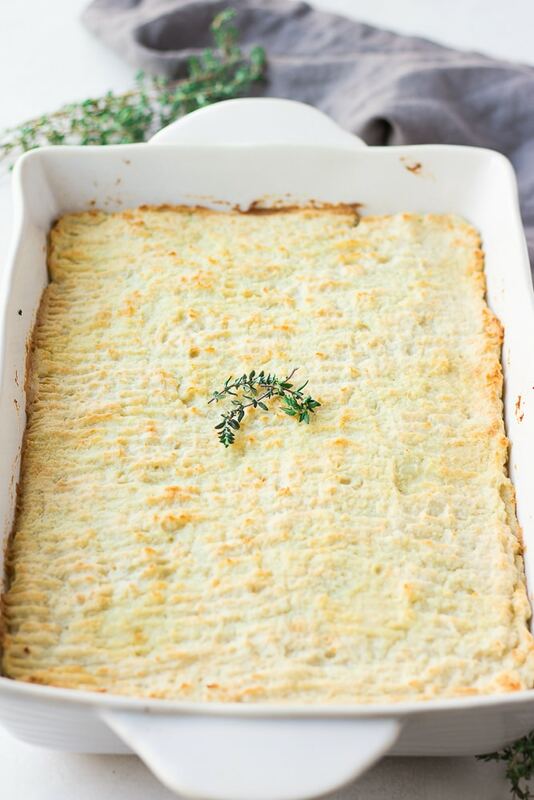 Comfort food classic: Vegan Shepherd's Pie. Made with flavorful cauliflower mushroom walnut "meat" and the creamiest mashed potatoes. No one will miss the meat in this hearty, savory dish! First, make a batch of Vegan Mashed Potatoes and thaw the peas and corn. If you are using whole cauliflower, wash, chop off the florets and place in food processor. Pulse, creating cauliflower "rice". Add 3 cups to a large bowl. Add the walnuts to the food processor, and pulse a few times until they are a bit crumbly, but do not over process or you will have a paste. Add the chopped walnuts to the bowl with the cauliflower. Now add the mushrooms to the food processor, and pulse until chopped small. Add to the bowl. Warm the oil in a large pan over medium heat, then add the diced onion and cook, stirring frequently, for about 2-3 minutes until translucent. Now add the cauliflower, walnuts, mushrooms, soy sauce, worcestershire sauce and spices. Stir until well combined. Continue to cook over medium heat, stirring every couple of minutes, for about 15-20 minutes. Add salt to taste, and remove from heat. Preheat oven to 400 degrees F and lightly grease a large casserole dish (I used a 9 x 13 inch dish, a 2-quart dish would work). 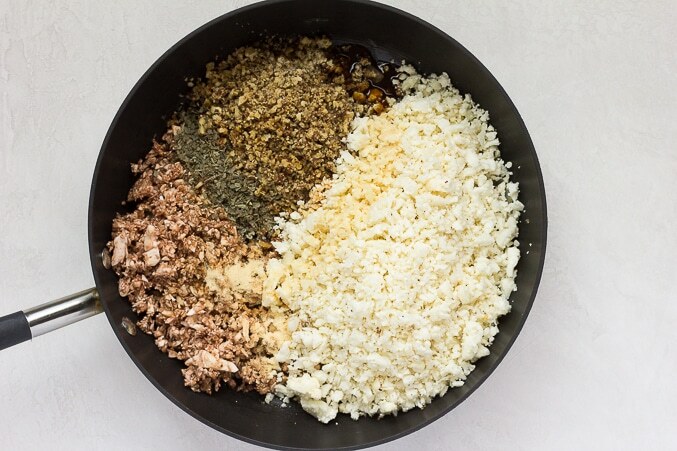 Transfer the "meat" to the prepared dish and spread the mixture evenly. Sprinkle on the peas and corn, then carefully top with mashed potatoes. Smooth them down with a spoon, then use a fork to add texture to the surface of the potatoes, if desired. Drizzle a tiny bit of olive oil, if desired. Bake for 25 minutes until bubbling on the edges and hot. For a more golden brown top, broil for an additional 2 minutes or so. Remove from oven and garnish with fresh thyme if desired. Serve. You can find riced cauliflower in the produce section of most stores, or in the frozen section. You can also use whole cauliflower florets, and process them to rice. For Gluten Free, use tamari instead of the soy sauce. For Oil Free, omit the oil to saute the onion (use vegetable broth instead) and omit the oil drizzle. Leftover Shepherd's Pie will save in the refrigerator for 3-4 days. I haven't tried freezing it.